Do you come out in the evenings? Jump Menu: Do you come out in the evenings? Can wasps chew through plastic? What happens if a queen wasp can't get out of a loft space when she wakes from hibernation? Will the wasp's nest fall on the ground after treatment? Do you charge a call out fee? We work evenings and weekends. We do not like treating nests early in the mornings for several reasons. We prefer to have wasps active and flying so we can see where they are entering. Can wasps chew through plastic? Wasps can chew through a variety of materials including plasterboard. We have seen damage to phone lines; they can chew through thin plastics. What happens if a queen wasp can't get out of a loft space when she wakes from hibernation? If a queen wasp cannot leave an attic after hibernation, she will either starve and die or find her way inside the house. Each year many queen wasps make mistakes and get inside the house instead of outside. Worker wasps that become trapped indoors also run out of energy and starve quickly. Will the wasp's nest fall on the ground after treatment? After a nest treatment, the nest tends to stay put and can last for many years (if protected from the elements) before eventually disintegrating and falling off. However, wasps will never use a nest repeatedly, so once all the wasps are dead, the nest is no longer a threat. After treatment, you will have dead wasps underneath the nest or the entrance to the nest. Once the nest is dead, we suggest you sweep the area and make sure people wear shoes in that area for a time after treatment. If we are called out for bees which we clearly state that we DO NOT treat, there will be a fee to cover our time and fuel costs. 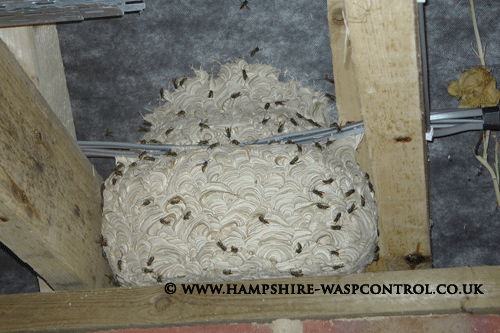 We charge £45.00 to treat any wasp nest with no further charges on top. £45.00 is the total charge.